3D printing is something only scientists and PhD students do, right? Wrong. Anyone can, right now, create a physical object from the depths of their varied imagination via 3D printing, using a machine that won’t require you to remortgage your home or sell one of your kidneys to a Russian crime boss. 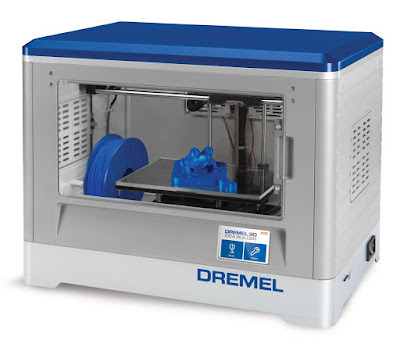 We review one such machine, the Dremel 3D Idea Builder. You hear the term ‘3D printed’ a lot these days, especially in the area of new technological innovations and design. For those who aren’t aware of how the technology works; basically imagine a big hot glue gun that is controlled by a computer, following a set design and ‘squirting’ glue into the shape of a 3D object. Replace the glue gun with a some precision apparatus, and the hot glue with quick-setting, high temperature plastic filament, and you have a 3D printer. However simple the process sounds, 3D printing technology has, until now, been expensive and complicated. From designing an object, to programming the printer, 3D printing has for a long while now been one of those things that “everybody will use… at some point in the future.” After testing the Dremel 3D Idea Builder we’re pretty sure the future is here already, as the damn thing is so simple to use. Seriously. After receiving the printer, taking it out of the box and plugging it in, we were printing our first object within minutes. 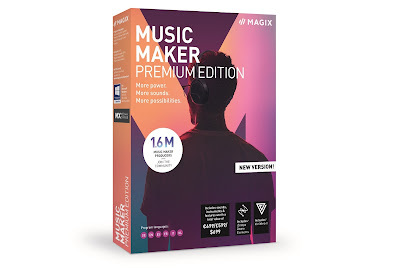 The big chunky box of a gadget (which is mostly plastic, making it surprisingly light and easy to lug about) features a touch display and several pre-loaded 3D objects, letting users knock something out immediately. We selected the school bus design, hit ‘print’, then waited a couple of minutes for it to warm up. The business end of the printer – the nozzle from which the plastic material is released – needs to get up to 220 degrees Celsius in order to melt the filament. So yeah, don’t touch that. And then it just started, zipping the nozzle over the printing plate quickly, making about the same amount of noise as a conventional paper printer. Three hours later (the length of time varies depending on the size of the object you’re printing) we had a very detailed little school bus model. At this point, we geeked out. As much fun as printing these preinstalled designs was (we also did a Batarang and a couple of bracelets – see pics), soon we wanted to get a bit more hands-on and start creating our own stuff. 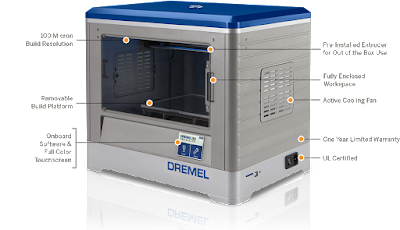 Here Dremel has made it easy for you again, as the accompanying software, available to download for free, is very simple and user friendly. It allows you to import objects and fiddle around with them, altering size and scale, as well as position on the printing plate. But, if you want to get fully creative, you’ll need to talk to someone else. And look, we even gave it a lick of paint afterwards. 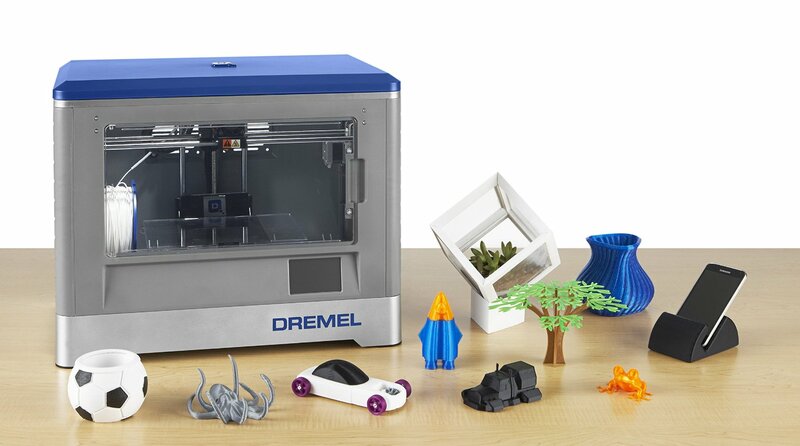 The quality of detail that the Dremel 3D Idea Builder produces is great, and although this was our first 3D printer, we were told by a friend who uses other models on a regular basis that it was very good, especially on rounded edges. The finer details can be made even finer by adjusting the thickness of the filament as it is printed; making the finished model even smoother, but increasing the print time. Of course, even on the finest setting, the finished product might need a touch of sanding - depending on what it is you’re printing. We were never that precious about the stuff we made, and actually like the look of the (slightly) textured surfaces of the items. One thing we did have a tonne of fun making was the Centriphone, a device for keeping a phone or action cam levelled as you spin it around your head on the end of fishing wire. Check out our review of it, but one thing we found super easy was changing the downloaded files by enlarging them, cutting holes in the 3D shape, and resizing them to fit our choice of action cam. We were able to do all of this (and successfully print it out, obviously) without reading any instructions or following any online tutorials. It really is that user friendly. 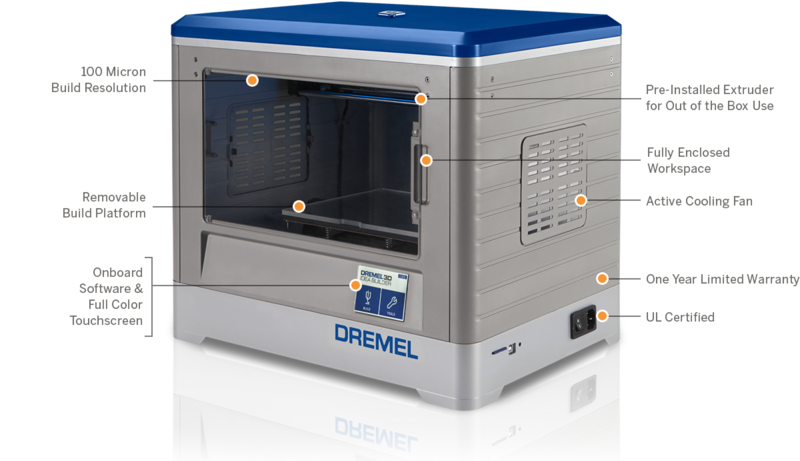 Due to it's rugged exterior we can imagine the Dremel 3D Idea Builder sitting comfortably on the workbench of a shed or garage. The casing, coupled with the opening door on the front, and removable lid on top, means it can take the odd knock (hopefully not during the printing process, mind!) and we were happy to see that this is a gadget, a tool, that will easily find a place in your home. This will quickly stop being a novelty item and start being useful on a regular basis – like a drill or a saw. Whether you need this to work on your latest gadget to drop onto Kickstarter, or just because you fancy mucking about with it to create some fun items, the Dremel 3D Idea Builder does a lot at a very competitive price. Welcome to the future, you beautiful bastards.